Dip tomato into boiled water for 5 minutes, remove skin and chop finely. Soak tamarind in 1 cup water, squeeze and take out the extract, keep aside. Crush green chilli, garlic, ginger, red chilli and cumin seeds using grinder. Add chilli powder, pepper powder, asefotida and coriander powder to this. Heat oil in a pan, splutter mustard seeds, add 1 pc red chilli. Add grinded mix to this and saute well. when the raw smell goes add tomatoes. Saute well till the oil seperates. Then add 1 cups water and tamarind extract to this. Remove from fire before it starts to boil. Garnish with coriander leaves. Serve hot with rice. Thtz one good looking rasam. I can have it as soup this instant. Goes well with rice and papad. My all time fav. Adipoli color!! 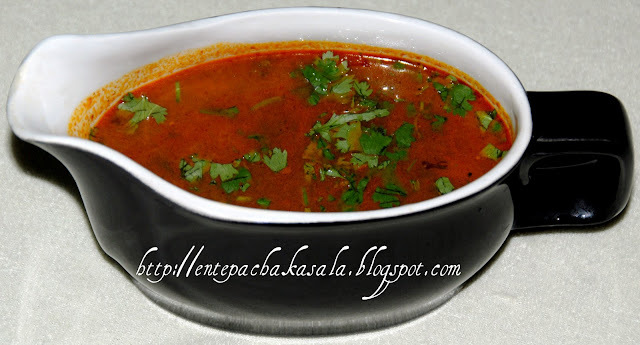 Ente fav annu rasam..Superb aayittundu ketto.. Thank you so much for the Diwali greetings! Happy Diwali to you too ( It is never late for a good wish). I am almost off blog these days, due to travels. But will read all your postings. rasam adipoli aayittundu...excellent presentation..perfect color...the aroma of rasam is coming here through the picture...loved the bowl too..
Love to have it with some hot steamed rice n chips..yum! My husband can actually drink this :) Thanks for sharing this recipe. 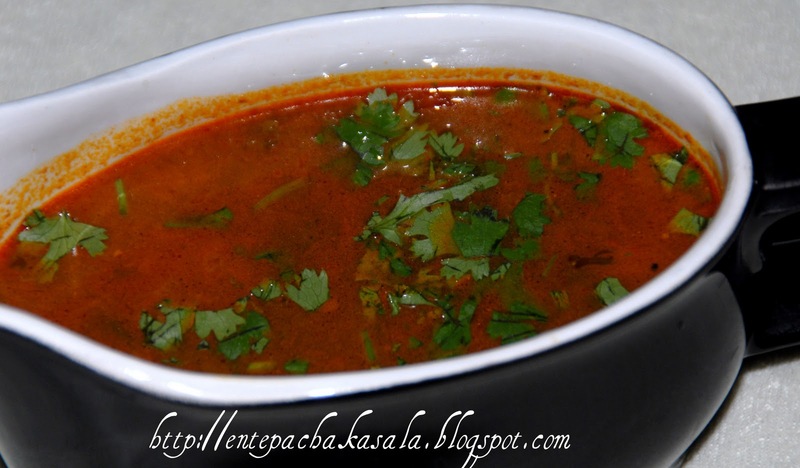 love the color of the rasam... perfect with a bowl of rice!